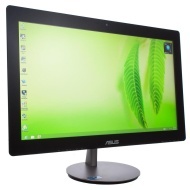 alaTest has collected and analyzed 4 reviews of Asus ET2322. The average rating for this product is 4.1/5, compared to an average rating of 4.2/5 for other Desktops for all reviews. Comments about the usability and price are overall positive. The reliability and design also get good feedback. We analyzed user and expert ratings, product age and more factors. Compared to other Desktops the Asus ET2322 is awarded an overall alaScore™ of 84/100 = Very good quality. The Asus ET2322INTH all-in-one desktop PC sports elegant looks and a decent feature set, but the performance lags behind competitors. Sleek, sophisticated design. Full HD IPS 23-inch display with 10-point capacitive touch. External subwoofer. 1TB hard drive. Blu-ray combo drive. Low-powered processor offers slower performance. Majority of ports inconveniently placed.